HOW HARD IS IT TO DO METALLIC EPOXY VS TRADITIONAL EPOXY SYSTEMS? 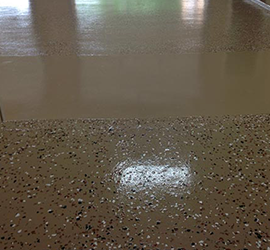 We have been getting an increasing amount of callers asking about doing a metallic finish epoxy floor. The first thing we ask is if they have any experience in doing this sort of floor. The answer is always no and that they saw it on YouTube and that it looked fairly easy to do. This is when we tell them it’s not as easy as it looks. It looks easy cause the person doing it most likely does it for a living or has done it many times before. Most of the companies selling metallic epoxy state on their websites or will tell you that their products are not that easy to work with if they’re honest. They say this at the same time as stating that there is no wrong way to do it. While that statement is true because the finish is random, there is definitely good and bad results and sometimes even very bad results. So while it looks like you are just splashing different colors on the floor it really takes skill and experience to get the ratios and the spreading of each color right for it to actually come out looking good rather than an eye sore. Doing metallic floors are much more labor intensive. You need to grind the floor usually and do a black base coat, then sand it and apply a seal coat and then splash the colors into the seal coat and then sand that when it dries and then you need to apply a topcoat. Some systems use a primer then a black base coat that you sand and then metallic paint that you sand and then a topcoat. Anyway you look at it, it’s a lot more work and the results most likely will not look like what you were expecting. There is skill and artistic talent involved in getting the looks you see on the internet. With traditional epoxy there is no skill level or artistic talent required. Just some good old fashioned elbow grease to clean the floor properly and then just apply the epoxy similar to regular paint. 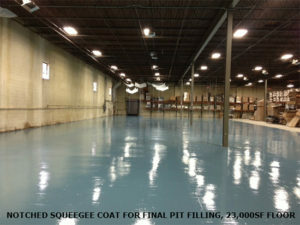 We package our epoxy in turnkey systems to make easy and simple for you to install a complete epoxy flooring job. There is some measuring and mixing involved so that takes a little more consideration than just sticking your roller into the roller tray and rolling the paint on like a semi gloss. But it’s way simpler to do than metallic and 99.999 times out of 100 you are going to be happy with the results. Check out our Epoxy Floor Systems on our Home Page and choose the one that fits your application best or give us a call for some expert advise on which to use. If you’re truly set on doing metallic, give us a call and we can price our metallic system out for you with a disclaimer that we are not responsible for the results. Also just to let you know that in the New York Tri-State area whenever we get a Metallic job we sub it out to a professional who does only metallic floors. We don’t even let our own professional installers do it! You should take that accordingly. One of the most frequent questions we get is do I still need to do an acid etching on my floor if it’s brand new. The answer is Yes. New concrete floors need to be etched twice in fact to get all the curing residues cleared out of the pores, plus you nee3d to wait 28 days prior to applying an epoxy coating. We recommend doing a strong etch first with some store bought muriatic acid diluted in a 3:1 ratio with water. After scrubbing in the solution and letting it sit for 10 minutes, rinse off thoroughly and do the second etch with the etching solution provided in one of your ArmorGarage epoxy flooring kits in a 4:1 ratio. If your kit contained TSP powder scrub that in after the 10 minute wait and just prior to your final rinse off. This will neutralize the acid and bring your slab back to the proper PH to ensure the highest level of adhesion between the concrete and your epoxy coating. If your kit did not come with TSP, pick some up at any Hardware Store or Home Improvement store. 1 lb per every 750 square feet is sufficient. The second most common question is, I have some hairline cracks, do I need to fill them in? The answer is yes and no. 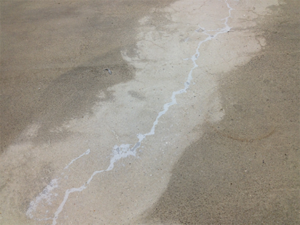 If the cracks are truly cosmetic cracks at the surface, the epoxy will fill them in. However even hairline cracks can sometimes run the depth of the slab making it difficult to fill in with your epoxy coating. Our coatings are very thick and they will fill in hairline cracks but be advised that if the cracks are 4 or more inches deep some settling can occur overnight as the epoxy cures. So the best course of action is to V out those hairline cracks with a grinding wheel on a small hand grinder. Then filling them in with a good quality concrete repair compound. Epoxy based repair compounds are the best to use. 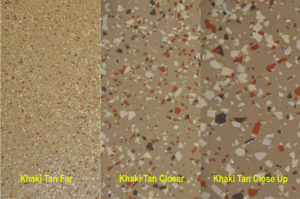 They are the strongest and are the most compatible with epoxy coatings. Do not use any silicone based products to repair cracks if you’re planning to paint your floor with any type of epoxy coating. Also try to avoid any premixed type of products in a tub or plastic container. While these products are inexpensive and easy to use, you get what you pay for and they more often than not crack or chip out of the cracks or divots you applied them too which ruins the look of your new High Gloss epoxy floor. ArmorGarage has two great crack and divot repair compounds that are just as easy to use. We have an epoxy crack repair compound that you can mix, putty knife into your cracks and divots and then immediately epoxy paint over it. No need to wait for it to cure and it will never crack or chip apart. Use this product after the floor has been etched and dried. It’s good for cracks up to ¼” wide, divots up to 3/8” deep and small pitted areas. Use our Crack & Joint Filling Compound for larger cracks, divots and for filling in holes. Once cured our repair compounds are rated for up to forklift duty so you’ll never have to worry about doing the repairs again. 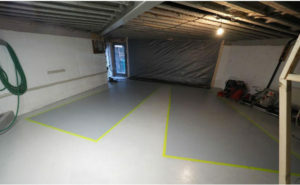 HOW LONG DO I HAVE TO WAIT BEFORE I PARK MY CAR ON MY NEW EPOXY FLOOR? This is a common question that has a few different answers. 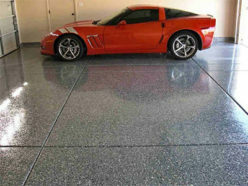 It depends on what type of vehicle you will be parking on your new epoxy floor and what type of epoxy paint you used. You normally have to wait a few days before parking any vehicle on a newly coated floor. The reason being is that although the epoxy will be dry to the touch in about 8-10 hours the chemical curing process is still going on. Technically speaking the molecular cross linking is still occurring and as time goes on the cross links get tighter which means the coating is getting stronger and harder. Depending on temperature and humidity we recommend you keep standard size vehicles off your floor for at least 3 days. Larger vehicles and SUVs should stay off 4 days. Heavy commercial vehicles should stay off for 5 days. 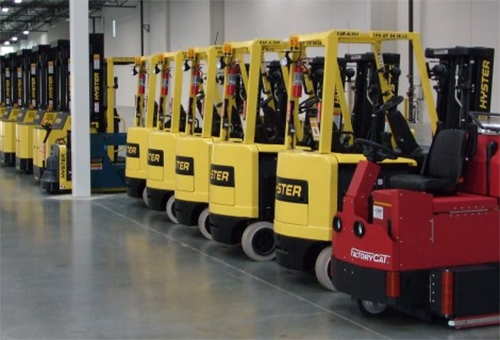 If downtime is critical we do make our Ultra Fast Drying military grade epoxy flooring system that lets you paint and be back in service, the next day! Although this coating is costlier to purchase, it can save you considerable sums of money from not having to shut your operations down for more than 24 hours. So depending on what your needs are, what kind of vehicle you have, what the temperature is and what kind of epoxy you’ve applied it will all play a factor in when you can start driving a vehicle over your newly epoxy painted floor. If you can wait an extra day, it’s better to be safe than sorry. You can also always contact us for our advice when it comes to questions about your floor. Sometimes you have too much stuff on your floor to completely clear out or maybe you just can’t stop what you’re doing business wise on the whole floor at the same time. 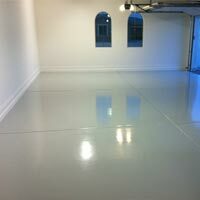 So you need to do the floor in sections so you can move your stuff around and or keep your business running while you redo your floor with an epoxy flooring coat. Once the floor is properly prepared (see how to prepare your floor for epoxy coating) you would apply a good duct tape line to section off the floor. Do not use painters tape since our epoxy is too thick for that. Apply the first epoxy floor coat up to the tape line and let dry. Then apply the second coat but stay back 6-12” from the tape line. If doing a third coat as in the case of our Military Epoxy System, stay back 12” from the edge of the second coat. Thus creating a step effect with the floor epoxy. Then carefully remove the tape, razor cutting the edge will most likely be needed. Before applying the first coat of the next section, lightly sand the first 6-12” strip of the first section to rough up. Then apply the epoxy to the second section and lightly overlap onto that sanded strip of the first section. For the second coat, you will lightly sand the strip of the second coat from the first section and lightly overlap the new section over that. Do the same if doing a third coat. The reason you need to sand those stripes is that after 24 hours the epoxy pores start closing and may affect the bonding of the overlapping epoxy. Follow this method and the epoxies will all blend into one monolithic coating making your floor look like you did it all in one shot.